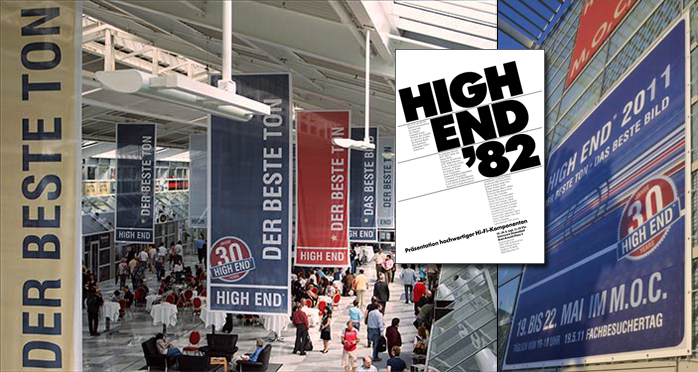 In 1982 all of 20 exhibitors joined to display upscale systems under the ‘High End’ show banner. This very small gathering paralleled the far bigger Hifi Video show in Düsseldorf upon which the High-End initiative then looked down with practiced disdain as a zoo for the masses and a mainstream mosh pit without proper conditions to demonstrate quality audio. A year later Germany’s then geographic center of Frankfurt with its Kempinski Hotel became the venue of choice and remained that way until 2003 when things bust at the seams for good. Too many manufacturers clamoured to participate in the success of the event which now exceeded the Kempinski’s capacities. This prompted the move from the river Main to the river Isar and Munich’s M.O.C. where this year’s High End from May 19th to 22nd was the eighth installment already. Without overdoing history, one should acknowledge that the event has been ongoing for 30 solid years now. Huzzah! Survival of the fittest and all. Sans slumming but in style. With beginnings so small as to be barely noticed, High End has morphed into Europe’s biggest industry do and more than one insider considers it more important now than CES in Las Vegas. That the intimate charm of ‘small, freaky, cozy’ has made way to ‘global biz’ comes with the territory but that ain’t bad. Cozy events remain on rotation throughout the EU. Let’s bang the big drum for a change. 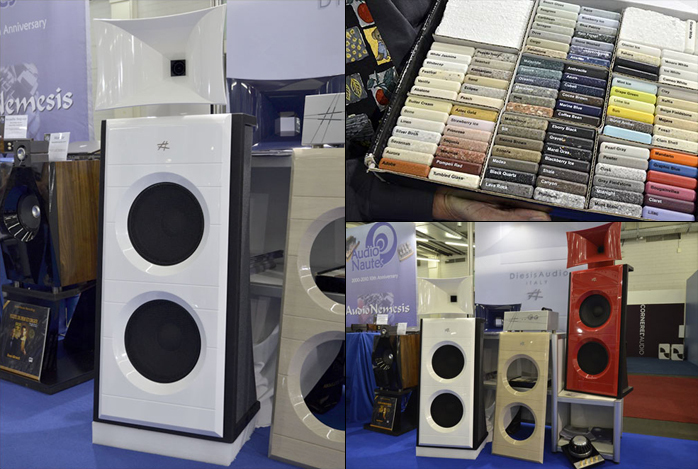 Fairaudio brought its own sticks in the hunt for high-fidelity novelties. Hubba hubba. 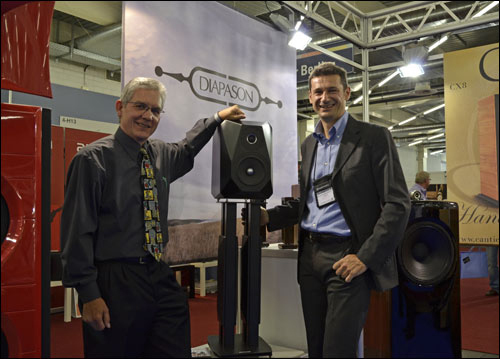 Fitting this bill were the objects Thomas Blumenhofer and his sales & marketing man Andrea Vital of Blumenhofer Acoustics had snuck past the guards in their suitcases to remind audiophiles that sheer size and wildness remain en vogue. Considered from the side, the 4.5-meter long folded bass horn of their Wiki prototype makes it one of the more generously proportioned yes two-ways we’ve come across. Madame Blumenhofer did the christening whilst one fine day spotting her husband deep inside the horn to ask whether he was now building Viking boats. Well, the three ‘sails’ of this ship add up to a compression treble horn (1) with 75mm Beryllium tweeter; a front horn (2) for the 38cm woofer and a 4.5m back horn (3) for the same woofer. Those desirous of more power have access to two optional corner horns with compression loading. Asked about price Herr Vitali merely offered a conciliatory grin which we’ll translate into deep 6 figures. Nuts. Sadly not on demo on site, a shuttle bus between München and Walkertshofen transported horny hunters to the factory for a real here hear. Clearly more on terra firma albeit still far from conventional was the firm’s second introduction. Gran Gioia—Italiano for big friend—is the first entry in their new Gioia Range which occupies the strata above the established Fun and Genuin models. As in the Wiki a 38cm mid/woofer is front-loaded by a horn but then vents out via floor-firing bass reflex. 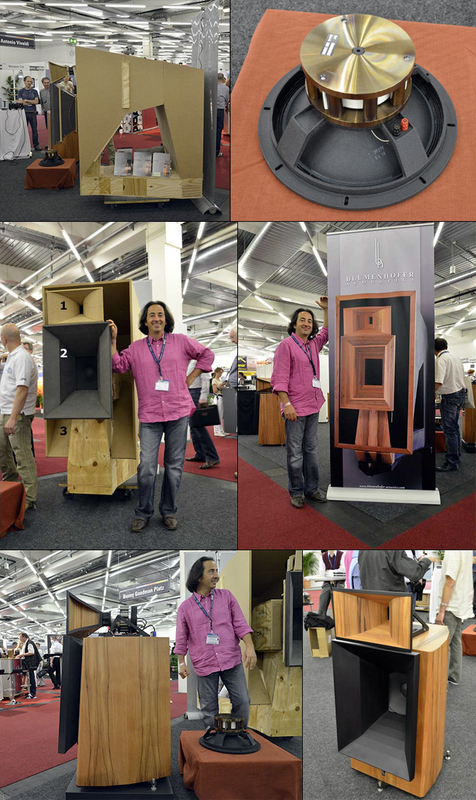 Said woofer is a collaborative effort with a German company. Its paper diaphragm is powered by such a potent motor that its "reflexes exceed those of the excellent TAD 38cm equivalent" claims Vitali. 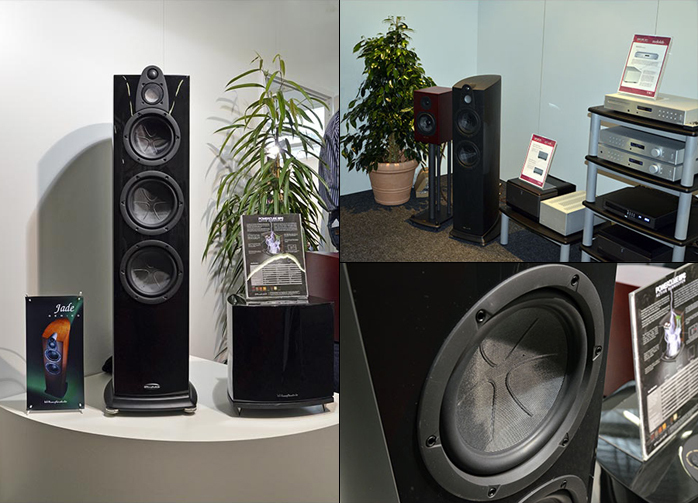 HF is handled by a 75mm tweeter with in-house developed compression chamber. €45.000/pr brings home a pair. Those with cash to burn—approaching €70K—can opt in for a field-coil driver. The next Gioia model will be significantly cheaper. Let’s remain with speakers for a bit longer but enter more earthly realms now. Mainstream brand Wharfedale founded in Southern England in 1932 announced a summer launch of a new speaker range called Jade [biggest model Jade 7 shown]. Think two monitors and two floorstanders from €798 to €2.598/pr. The firm refers to the enclosure material as ‘Crystalam’, a laminate of wood and wood-derivative materials said to attenuate cabinet talk to inaudible levels. The bass and midrange units get ‘Acufiber’ diaphragms. That’s shorthand for a woven matrix of glass and carbon fibers optimized for just-right self damping that won't overdamp musical transients. Responsibilities for jaded R&D were shared between British Peter Comeau and the busy German speaker designer Karl-Heinz Fink. German importer IAD GmbH combined the Wharfedales with Audiolab electronics, specifically the new 8200MB monos and 8200DQ as source/preamp, the latter identical with our recently reviewed 8200CDQ minus the ‘C’ for the transport section which subtracts €300 from the €1.199 sticker. The DAC/pre combo starts shipping July/August 2011. A similar combo was on offer by Kassel company B.M.C. 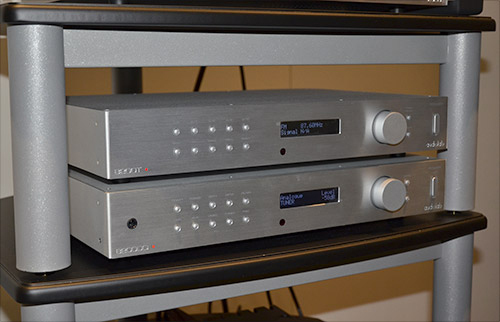 Audio in their DAC1 presented here by Manfred Penning. While that’s available sans analog inputs too, in accordance with the firm’s modular approach a €300 board with 2xRCA/1xXLR adds up to €2.998 for a DAC/pre. Brand new was the USB module which now enables 24/192 data in asynchronous data transfer protocol whereby feedback from the converter controls the music stream package delivery of the computer for reduced jitter and better sound. €350 adds the new USB module to older B.M.C. DAC1s. Betting on async USB too with North Star Design was Herr Israel of Italian import specialist Friends of Audio shown here with monsignor Schiabi of Diapason. North Star introduced their €1.600 Essensio Plus which like the non-plus offers 5 x S/PDIF inputs and 32/192 async USB but then adds an (optionally defeatable) headphone output and variable outputs by remote or frontal control. Attenuation is a hybrid of analog and digital. The former is set to 1, 2 or 4V whilst digital handles fine 0.5dB adjustments. The resistive analog trim is advantageous particularly at lower levels to maintain max resolution. New in Friends of Audio’s catalogue was a mature beauty named Caput Mundi from Italian speaker house Diesis Audio. This 3.5-way affair with twin dipole bass and coaxial front horn tops out at 140cm and weighs 97kg each, the latter more than partially due to the ‘CLAD58’ frame material, a compound of minerals bound in resin. The speaker is available in a bevy of colors and the front is easily replaceable to switch finishes. Pricing was TBA but will probably come in around €30K.